Image: Dark Horse. Art by Mike Mignola and Dave Stewart. Last year, comics legend Mike Mignola announced that he’d be taking a break from the world of comics after the poignant end to his work on Hellboy in Hell. Well, consider that break over (for now): io9 can exclusively reveal that Mignola is teaming up with Helena Crash artist Warwick Johnson-Cadwell for a new graphic novel. Being released by Dark Horse later this year, Mr. Higgins Comes Home will be Mignola’s first major comics work since he ended Hellboy in Hell (although the Hellboy universe, often dubbed the Mignolaverse, has continued unabated at Dark Horse, with Mignola still co-writing and offering guidance for books in the franchise)—and this new tale is deliberately set outside of the continuity and lore of that setting. 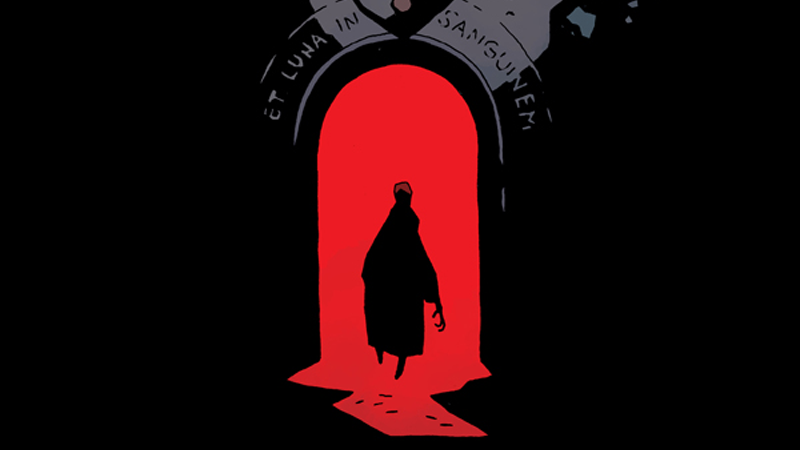 The graphic novel, written by Mignola and with art from Johnson-Cadwell, is a send up of classic vampire stories, as two Vampire hunters convince the titular Mr. Higgins to return to the scene of his wife’s tragic death and confront the dark mysteries of what happened to him at the sinister Castle Golga. Check out Mignola and colorist Dave Stewart’s cover for the book in full below. Mr. Higgins Comes Home will hit comic store shelves on October 25, with a wider release in bookstores coming on the most perfect of dates for Mike Mignola’s return to comicsdom: Halloween itself, October 31. What The Hell Is This Crazy Monster, Designed by Hellboy&apos;s Mike Mignola?